SpeedUpMyPC lets you monitor and control all your PC resources with easy, one click instructions. System settings, internet usage, disk clutter, RAM and CPU are all automatically scanned, cleaned and optimized for peak performance. You can also selectively disable or remove unnecessary background and auto-start processes to cut valuable seconds off your startup time. SpeedUpMyPC scans your computer to identify all the processes. ...... for improved performance. With single click simplicity, network settings, RAM and CPU function are all scanned, cleaned and tuned for speed, while junk files are deleted for space. The result is a computer that works faster and better. 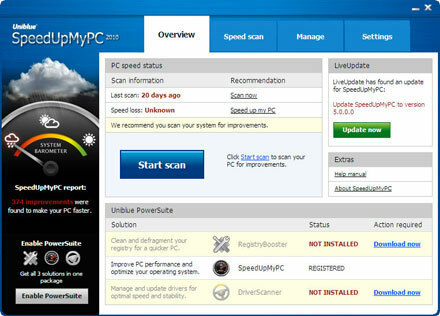 SpeedUpMyPC lets you monitor and control all your PC resources with easy, one click instructions. System settings, internet usage, disk clutter, RAM and CPU are all automatically scanned, cleaned and optimized for peak performance. You can also selectively disable or remove unnecessary background and auto-start processes to cut valuable seconds off your startup time. Qweas is providing links to SpeedUpMyPC 2012 as a courtesy, and makes no representations regarding SpeedUpMyPC or any other applications or any information related thereto. Any questions, complaints or claims regarding this application SpeedUpMyPC 2012 must be directed to the appropriate software vendor. You may click the publisher link of SpeedUpMyPC on the top of this page to get more details about the vendor.